A delicious meal inspired by the Indian chef Bal Arneson. Press the tofu and cut into thick pieces. Combine the spices and salt on a plate. Press the top and the bottom of the tofu into the spices to get a nice coating. Heat up the oil in a non-stick pan and cook on the first side until the tofu is crispy. Cook the second side. Slice potatoes into circles, place in a pot and cover with 1/2 cup coconut milk and however much water to cover them. Bring to a boil and cook until fork tender. Slice the onion into semi-circles and sauté in oil until soft. Add the rest of coconut milk, lemon juice, coriander and salt.. Add the peas and simmer until peas are done. 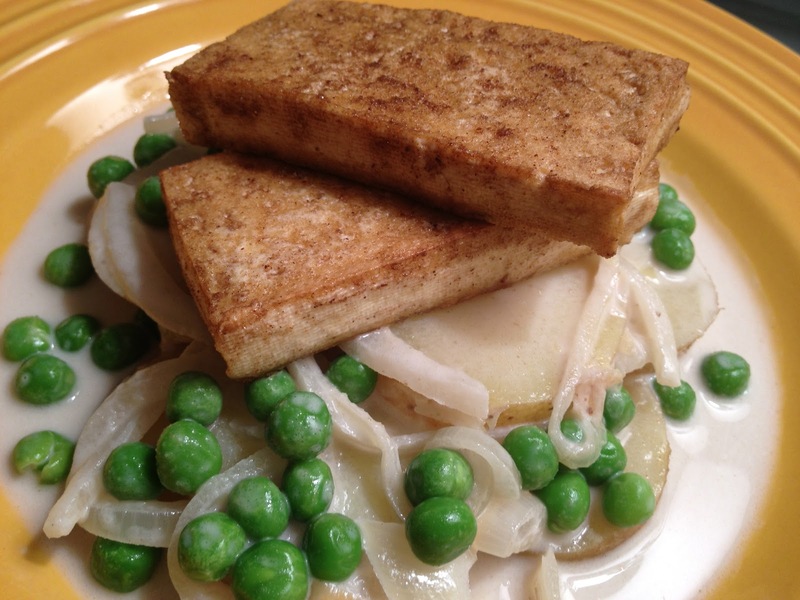 Gently place the potatoes on a plate, top with coconut sauce and place the tofu on top. Enjoy!